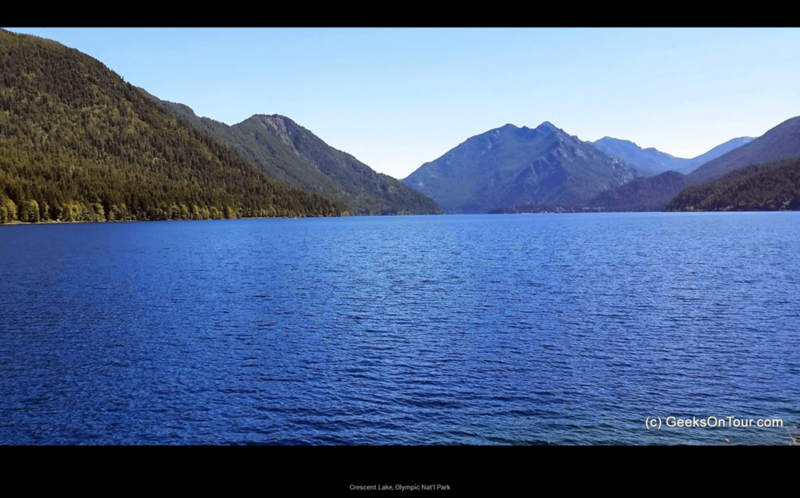 Pictures Look SO good in Google+ Photos! In reviewing 2014, I’ve been spending a fair amount of time looking at the pictures I’ve uploaded to our web albums during the year. We have certainly had quite a year, and the way Google+ handles our photos it looks even more impressive than it was. I love how Google lays out my pictures in a mosaic collage with very little space in between photos. Somehow that layout makes the memories seem more … well, just more! Click on any one picture and you’re seeing it fullscreen, or almost anyway. They leave some space at the right for information about the picture. The right sidebar is where any captions will show up, and it gives a space where friends can leave a comment on the photo as well. If you click where it says ‘Photo details’ you’ll see when the picture was taken, what camera took it, the location on a map (if that information was captured) and even information about the camera settings that were used. In this view, you have arrows at the bottom to move to the next or previous picture. To see a slideshow of the pictures in truly fullscreen, click the ‘slideshow’ menu at the top. You’ll now be viewing the current picture fullscreen. To play the slideshow, move your mouse and you will see a “Play” button appear bottom center. Next to play will be an X so you can get out of slideshow view if you want. Google+ also automatically enhances each photo. It does an automatic contrast correction and a bit of saturation on the color. I really like the rich images that result. Some photographers don’t like what it does – no problem, you can turn that feature off. To turn it off for one photo, first you need to be viewing just that one photo. 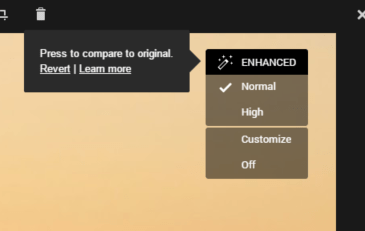 Then, when you move your mouse the indicator that the picture has been enhanced will appear, hover over it and you’ll see that you have options to leave it at “Normal” enhancement, High, Customize, or turn it off altogether. You can also turn off enhancements for an entire album. If you’re viewing the album, click the drop down arrow at the right end of the menu. You’ll see an option to Apply Auto Enhance and when you click on that you’ll see options for Normal, High, and Off. 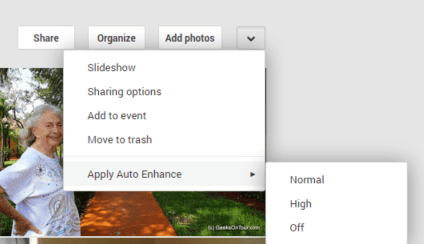 How to get your Photos to Google+ Photos? The easiest way is using Picasa. I’ve been using Picasa on my computer for managing all my photos for many years. All the best ones, or the ones I need to tell my story even if they’re not great, I upload to a Web Album. It used to be called Picasa Web Albums. All the pictures I uploaded to Picasa Web Albums are now seen by Google+ Photos. Now the Upload button in PIcasa says “Share on Google+.” All the pictures I’ve been uploading both before and after the change to Google+ are all there. If you choose Best for Sharing, Google will resize your image to no larger than 2048 pixels on the longest side. If that means nothing to you, then I’m pretty sure that size is plenty big enough for you. This is the setting I use because, with ‘Best for Sharing’ size, Google provides UNlimited FREE storage space for your pictures. My Google+ Photos account has over 50,000 pictures and it doesn’t cost me a penny. If you leave this blank, then the pictures you upload will be for your eyes only. Nobody else can see them. Most of mine are shared with Public. You can also share with individual people by entering their email in this space. We have several member tutorial videos on this topic. Published by MrsGeek, in Blog. Tagged with #GeeksWhoTeach, Android, Apps for Travelers, Droid, Geeks on Tour, Google Photos, iPad, iPhone, smartphone cameras, Smartphones, Technology for Travelers.